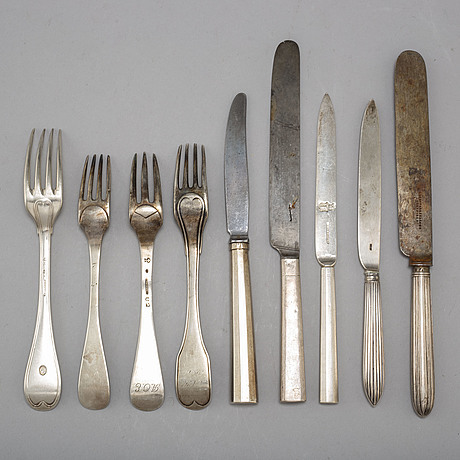 SILVER CUTLERY, Sweden and Northern Europe, 18th-19th century (40 pieces). Five fruit knives, presumably marked with JFS, length 21,5 cm (two restorations and one with chip) (306 gram). Five fruit knives, with later stainless steel knives, Augsburg (ruptures), length 22 cm (total weight 434 gram). 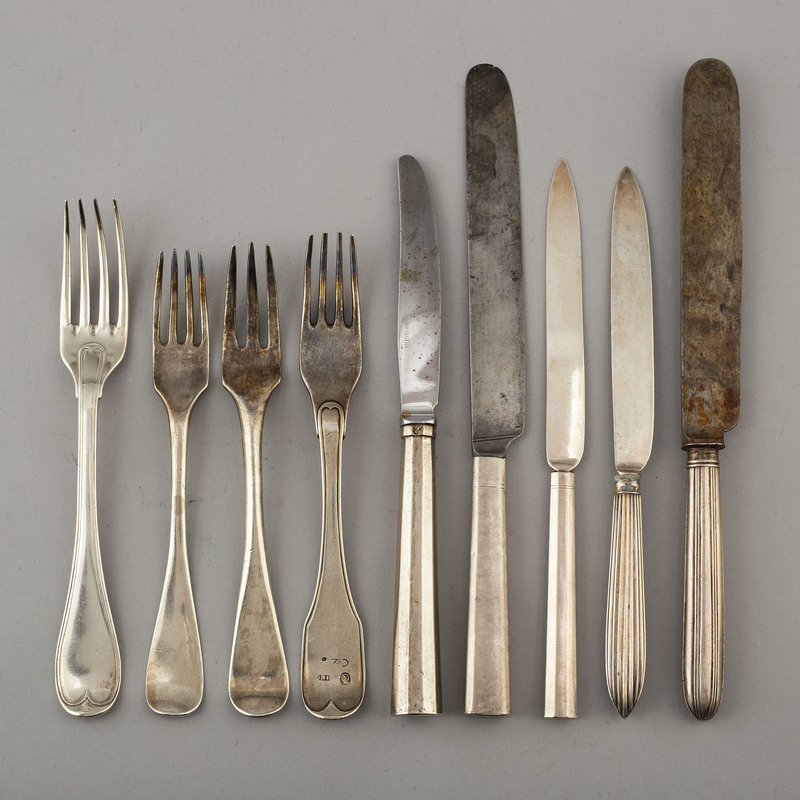 Six dinnerforks, (one marked with Eben parker & Sons Sheffield), four dated 1815. Length ca 26 cm (522 gram) (dents, wear, ruptures). 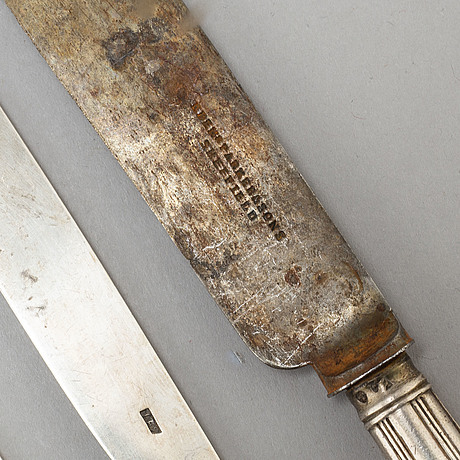 Gustav Hamnqvist (1789-1818), Åmål, 12 fruit knives, with a royal shield, length 22 cm (376 gram) (minor ruptures and dents). 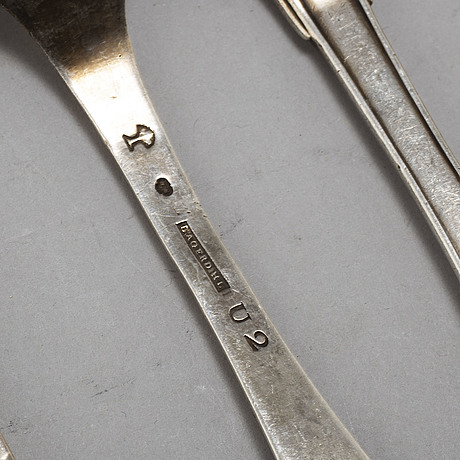 Pehr Zethelius (1766-1810), Stockholm, four dinner forks, 1798, length ca 19,7 cm (324 gram). 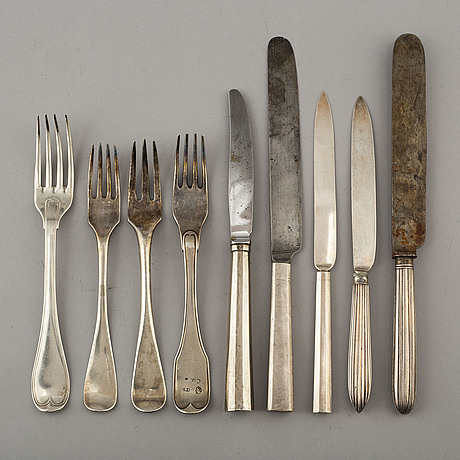 Anders Stafhell (1755-1794), Stockholm, three dinner forks, 1775, length 18 cm (152 gram). Johan Bergengren (1752-1788), Kristianstad, two dinner forks, 1785, length 18,6 cm (engraved) (147 gram). 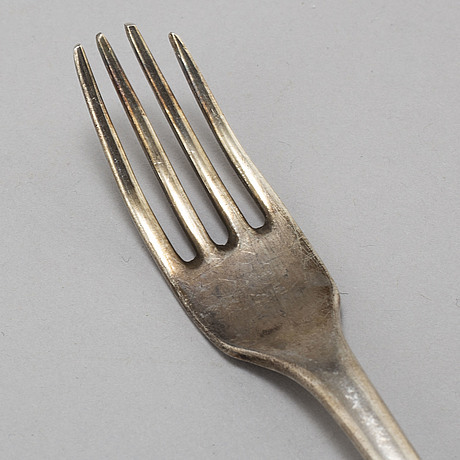 Johannes Lagerdahl (1797-1804 (1838)), fork, 1802, length 18 cm (55 gram) (engraved). Two dinner forks, length 17,5-18 cm (chips), (99 gram). Scratches. Ruptures. Dents. Some partly renovated. Minor chips. Wear.